If we judged movies purely on originality this might have been the film of the year. It’s the near future and water shortages in urban Los Angeles have caused the population to riot in the streets, but we zero in on a musty hotel full of characters run by the bedraggled Nurse (Jodie Foster), aided by her massive orderly Everest (Dave Bautista) on a single night during her work. 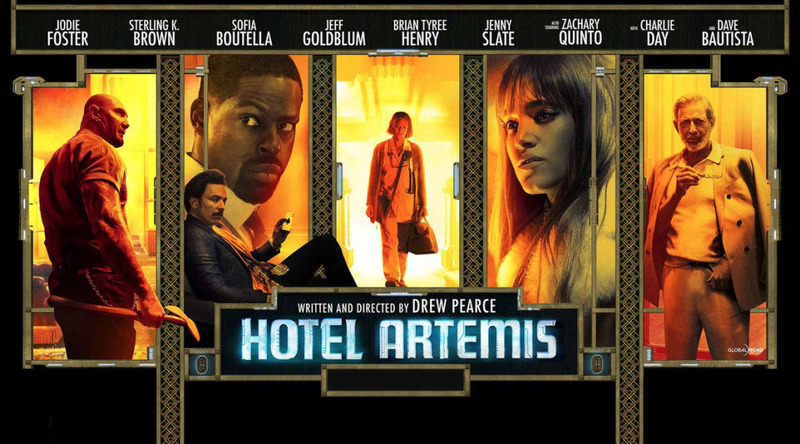 Hotel Artemis is a safe house for the city’s criminals, the themed rooms all hospital suites where Nurse and Everest can patch them up after they’re injured in their various lines of work. It’s a lot of promise the execution unfortunately doesn’t really deliver on. Everyone is having fun and several actors like Charlie Day are excellent playing against type as a bloodthirsty maniac. Unfortunately, the film as a whole not only doesn’t hang together as well as you want it to, it’s ironically a bit colourless, like the faded walls of the Hotel Artemis itself. The script and direction by Drew Pearce aim high at a noir atmosphere and instant cult status, but (in line with the themes) it needed more energy and (in spite of the themes) more of a sense of fun, coming across as tragically dour and bleak. Naming the characters after 70s-era American holiday spots doesn’t make a cult classic. Nurse and Everest are preparing for a busy night when Waikiki (Sterling K Brown) drags his shot-up brother Honolulu (Bryan Tyree Henry) in for Nurse’s care after a robbery gone wrong. Already checked in are the nasty, wisecracking Acapulco (Day) and the svelte, mysterious Nice (Sofia Boutella). Everyone seems to know each other, either through reputation or past relationships, and they all have an agenda that’s going to turn a blood-soaked night at the Hotel even deadlier when they all play out. And hovering in the shadow of every breathless conversation or veiled threat is the Wolf King (Jeff Goldblum), the crime boss who runs LA, owns the hotel and employs Nurse. There are arcs and climaxes for each character that all come to a head in agreeable enough fashion in the script, so maybe that’s proof enough there was nothing wrong with the story itself per se. But for something that seemed machine tooled to be effortlessly cool right out of the gate – posters of which might one day adorn film students’ walls like the work of Tarantino or Truffaut do now – it’s not much more than a noble failure.